At WaterPave we’re the go-to name for high-quality, long-lasting alternatives to pervious paving with materials that are built to last, keeping your newly landscaped outdoor area looking better for longer. We’re the industry leaders when it comes to affordable water permeable (or porous) concrete and paving solutions, working hard to maintain our reputation for delivering outstanding customer service and expertly made materials. We supply both DriveCon™ permeable concrete and DriveTec™, which features a resin-bonded stone top layer. If you’re not sure where to start then don’t fret, our team will help to walk you through our product range, finding the right material to suit the needs of your upcoming landscaping or renovation project. Big or small, commercial or residential, we have the right tools for any job, with our experienced team able to meet any challenge. Unlike many lower-quality pervious paving materials, our products provide a more environmentally friendly paving option. Their design helps to recharge groundwater while working to manage storm water run-off and reduce the amount of pollution that often finds its way to our natural water systems. They carry an outstanding aesthetic value, and with different styles and looks to fit into any design scheme. Pervious paving also reduces the amount of land used to manage storm water run-off, meaning you’ll not only be saving money by installing WaterPave products, you’ll also be saving space around your home or office. The materials also aid in temperature regulation, reducing local heat islands on the surface during the hotter months. Want to learn more about the benefits of water permeable systems or discover more benefits of working with quality alternatives to pervious paving materials? 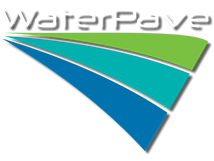 Don’t hesitate to get in touch with the WaterPave team by clicking here.